01. Maria tried to get into Brother’s enclosure; she lay there leisurely. Maybe Brother and other dogs will accept her after a few days. 02. Sporty’s skin is really soft or even more – delicate. She had new a collar but her head was scraped by it. 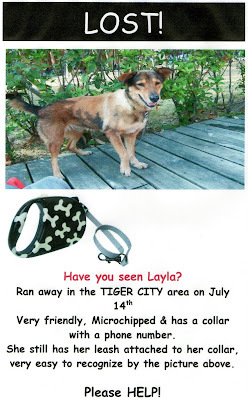 Fortunately, it was not too serious so we change another type of collar. Hope she won’t get hurt again. 03.Honey comes back for a short stay until 24th. She is a little shy when there are too much people. 04.Precious’ family took her to AT; they are looking for a new member as Precious’ sibling. May is their idea mate. We wish May all the best for a suitable family. 01. Hobbit’s ears health has improved a lot when we cleaned them today. The amount of dirt has decreased. 01. There were a lot of volunteers from Fo Guang Shan this morning. With their help, we finished the work in a swift speed. 02. Volunteer Lucie loves our cats; in spite of being tempted to adopt Buddy and Jackson, she also likes Simba. Although Simba is still a little shy, he needs more practice familiar with people. 03.Weird-temper Hei Hei likes volunteer 宏軒 very much so he invited Hei Hei for a walk to river side bank today. We guess Hei Hei had a good time there. 01. Maria move to Brother’s place. Although she talks a bit too much and makes some noise, still, we hope they can get along together better and better. 03.Due to the bad weather, there were very few volunteers walking dogs. When Neu Neu went back to her room, she looked at Hong Jun sadly. What a pity! 01.Phoenix tried to joint Da Hei’s place; everyone was curious to get close to her. When Whitey passed over her, she barked loudly. Maybe she was nervous. 02. When Dani saw volunteer 大熊 coming, she was really happy. 01. Volunteer Lucie came to AT today. She likes cats very much, especially Buddy and adorable Jackson. She attempted to take them home. 01. Addie has been transferred to the isolation room B with lovely sunshine and nice breeze. Every afternoon, he is taken to the top balcony for a small walk and sunbathing. 01. Nico and Phoenix went to hospital for ligation and had vaccination. Puppy Dani went for her first shot as well. Hopefully, she can recover sooner. 02. Maria was bullied by other dogs again last night so that Hong Jun decided to put her with Liberty together until she gets better and she will change room. 03. There was a lady with two little boys came to the centre for cats. They are interested in lovable Sheila! We wish Sheila will go home with them after their discussion. 01. Juno and her new friend Marble had a great time today. It is surprised that Marble is willing to play with such a fidgeted little boy. 03. At noon, we “watered” our dogs to cool them down by the newly set pipe. The curious Juno jumped over the water for fun which made a funny picture. 04. When Maria is away from Room 1, Vienna goes back to her old place. Perhaps Hobbit is the happiest one because when these two old friends met, they bit each other lightly for fun. 01. Nico has fully recovered from his injury at the foot. He doesn’t need any bandage just wait for his skin and fur growing back. 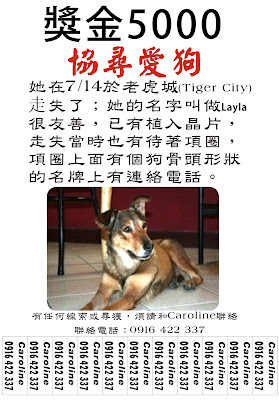 Ran away in Taichung Taiger City area on July 14th , very friendy.microchipped & has a collor with a phone number, she still has leash attched to her collar, very easy to recognize, by the picture above, Please help !! !